The main goal of the work is to find out in which aspects of language can the hypothesis of symbolism be manifested. Therefore, I will use data drawn mainly from internet surveys to test the potential role of symbolism in Indonesian words demonstrated in their concept, in the emotions they express and in their position in the language system. In conclusion, I will try to find out what role does the cultural and language background of the respondents play and if the responses could be affected by actual symbolistic relationship. 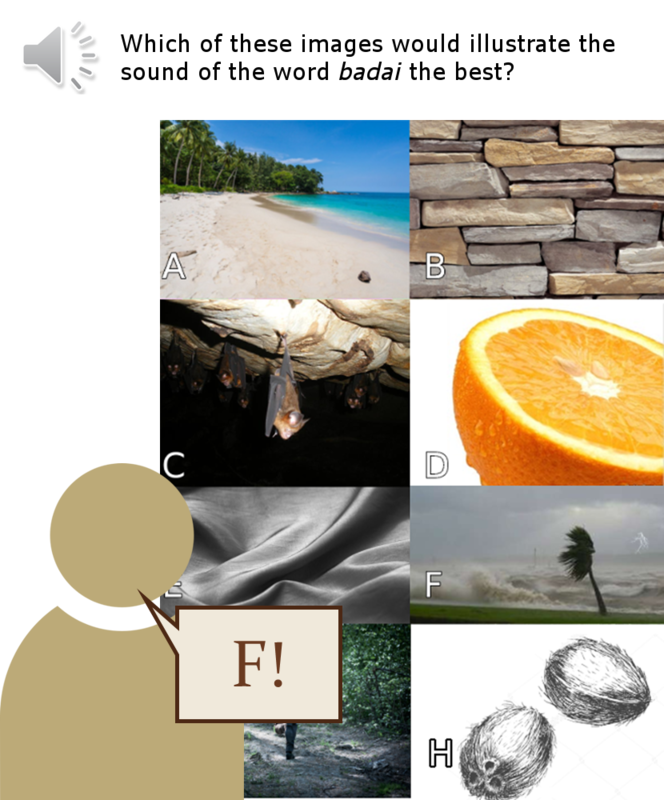 Many models of how the sound of the words is affected by their meaning emerged in the history of linguistics.  The first theories were searching for a connection in the simple sound resemblance or in our emotional reactions. Since those theories weren’t founded on much empirical data, they were a sitting duck for an analytical linguist Ferdinand de Saussure at the dawn of the 20th century and for many years, any kind of connection between sounds and their meaning was disputed as arbitrary. In recent years, this view is being find to be too insular, as it doesn’t consider more complex sound patterns. This work deals with the history of thinking about the origin of language and its implications. In the theoretical part, I will discuss the most famous hypotheses of the origin of language that had floated to the surface throughout the history of the debate. First, I will focus on the early theories such as ding-dong, pooh-pooh and bow-wow hypotheses, then I will show their shortcomings which had been pointed out by Saussure’s structuralism. and Chomsky’s theory of universal grammar. Each of these eras of linguistics will be put in context of the hypothesis of symbolism according to which there is a natural connection between the meaning of the word and its physical form. I will attempt to find out, whether symbolism could operate via the sound similarity, via an association in the neural signals or via the neuro-motorical imitation of the word’s concept. According to the bow-wow hypothesis, human communication began with mimicking the sounds of nature. The bow-wow hypothesis says that this simple howling and whistling developed into settled forms (interjections) which subsequently gave rise into the complex language system we know today. In 1960’s, Noam Chomsky developed the theory of Universal Grammar. On the basis of simple experiments with children similar to that shown in Figure 2, Chomsky noticed that the complex Saussure’s equations ​​can be largely simplified. Chomsky discovered that there is a simple, inherent, neural system that allows us to comprehend the basic concepts of language. Thanks to this system, children can quickly start to recognize the important information in the sound; Chinese kids learn to focus on the melody, English kids learn to focus on the individual phonemes. In practice this means that a 2.5 year old child is already “tuned” to the sound space of its language. 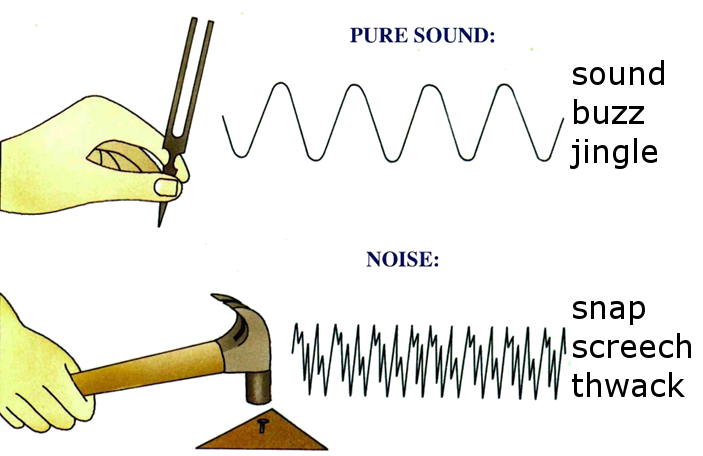 Sound symbolism should not be therefore based on the specific phonemes but rather on their contrast. 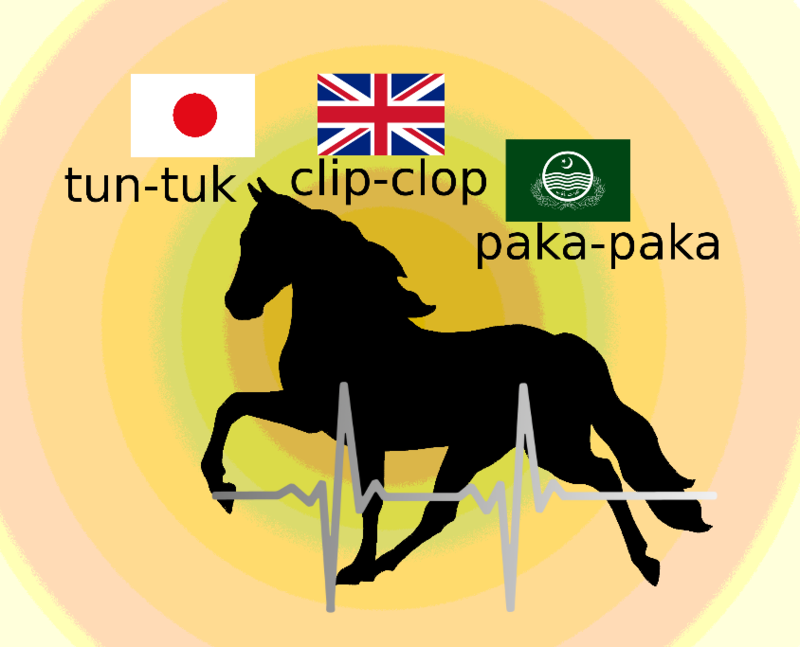 As illustrated in Figure 3, there are very different names for horse’s clip-clop in Japanese, English, and Punjab, but in all cases, we hear the sound symbolism in quickly changing place of articulation. Contemporary theories of sound symbolism are therefore rather concerned with the principles upon which we perceive the words, rather than upon the emergence of the specific phonemes. 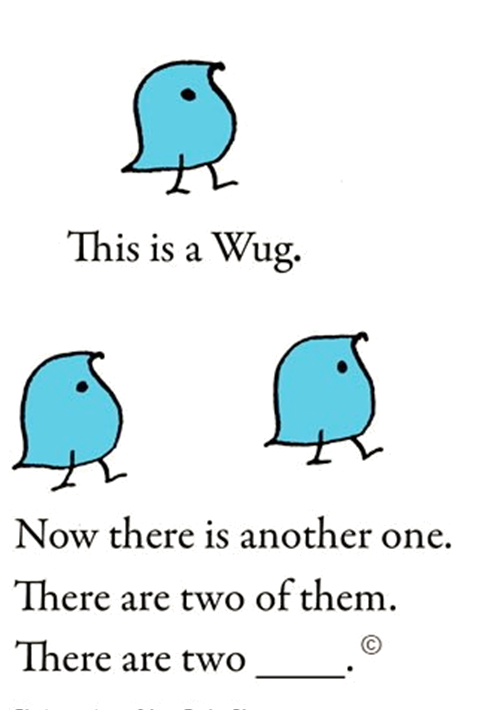 The most famous evidence that some patterns exist is the kiki-bouba effect. 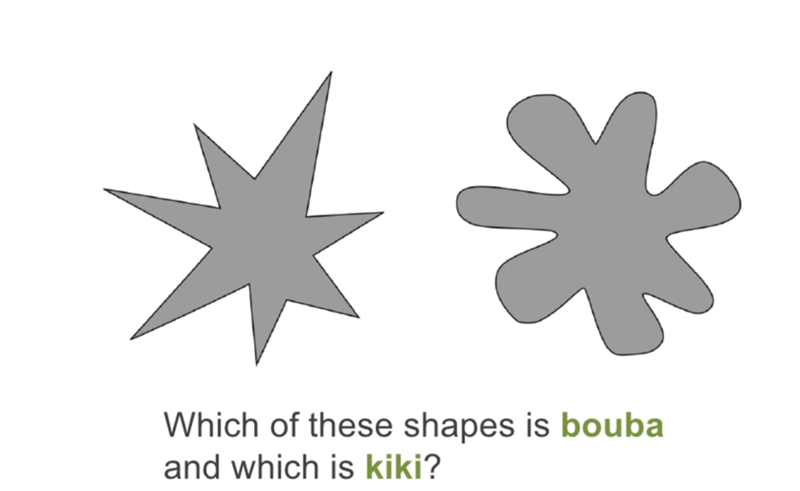 If we ask respondents which of the shapes depicted in Figure 4 should be called kiki and which bouba, 95% of them, regardless of culture, respond that the sharp shape should be called kiki. As we will see, this so-called shape-symbolism emerges in the contrast of two opposites in many languages. Point of my study was to test the basic theories of the origin of human language. Indonesian was chosen as a model language because as an old lingua franca of Austronesia, it could resemble the austronesian proto-language and because as an analytic language, many of the original word forms are preserved. In principle, the experiment was very simple: 16 basic Indonesian words were chosen and let the total of 243 of my Czech respondents guess their meaning. If the respondents were significantly more successful than if they guessed the words randomly, it would indicate there are certain patterns in our perception of the sounds of words similar for both of the languages. Three main aspects of sound symbolism were tested: the ability of the respondents to guess meanings of the words in general (existence of the sound symbolism), the ability to connect the right emotions with the words (the pooh-pooh theory) and and the ability to distinguish a word from others with a similar meaning as could be derived from structural linguistics. For testing the emotional connection, a set of 10 emotions based on the Eckman’s 7 basic emotions was chosen and observed whether the emotions claimed by Czech speakers matched those assigned by the Indonesian speakers (87 respondents). The respondents’ ability to read Indonesian grammar rules and to assign the meaning of the word to both abstract and concrete images was also tested, which were connected with the chosen words by native Indonesian speakers beforehand. When testing the ability to connect images with the words (Figure 6), the intention was to avoid the error in translation of the Indonesian concepts. The reason for that was that for example the image of a waving fabric would be closer to the Indonesian word for “smooth” (halus) than the English equivalent. However, from the data it came clear that my hypothesis does not apply, but not due to the lack of sound symbolism, but because the respondents were more successful at assigning meaning to the more concrete images. 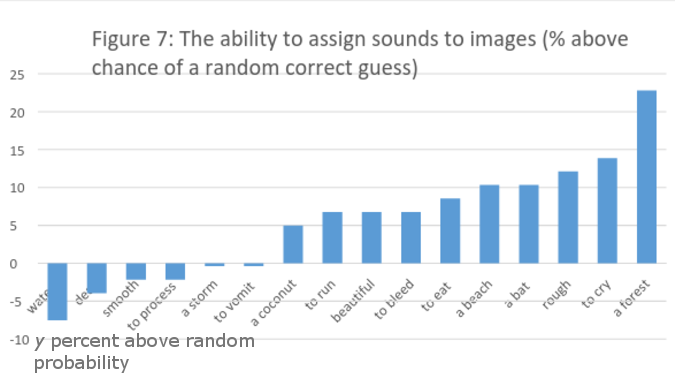 Nevertheless, the respondents were on average 6 percentage points above randomness, which still does indicate a certain role of sound symbolism (Figure 7). 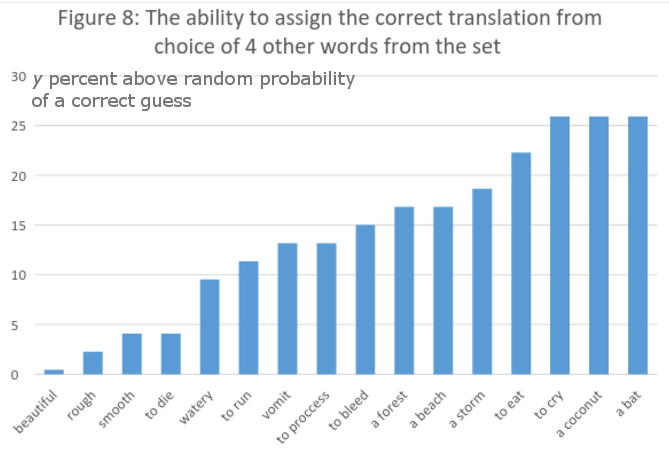 Thus, sound symbolism played a much bigger role when the respondent guessed the meanings from a set of 4 English equivalents – overall, the respondents were 14 percentage points more successful than if their guesses were random (Figure 8). Also, the data shows support for the hypothesis that a language’s sound system is crucial for the pattern recognition because there were distinct trends in the wrongly assigned words as well, depending on the language of the respondents. In sum, the Czech speaking respondents were better than English speaking respondents by 10 percentage points – it can be presumed this is because the Czech sound system is closer to the Indonesian than the English. Data concerning emotional link between the words and their meanings shows no significant correlation, even for the emotionally strongest words. Although the overall chance of determining was positive (+ 1%), from the point of view of the data from the translations, it can be assumed that even the correctly determined words do not bear an emotional connotation. For example, the word kasar (rough) has been rightly assigned not to be connected with joy (-11 %) and to be connected with anger (+4%). However, this apparent pattern is there likely because the respondents “heard” the connotation with roughness itself – the meaning of kasar was the third best guessed while when we take into account all the emotions Czechs assigned to kasar, the correlation is even negative. The most interesting results, however, came from testing structuralism. The chance to guess meaning of a word from a set of words with similar meaning was 6 % above randomness, which might seem like it is easier to guess the meaning from a random set of words, but the difference is not big enough because the choice of the “similar” words had to be subjective and the respondents who were choosing the equivalent from a set of others from the 16 words could have used the other words to gain more information. The data even showed the kiki-bouba effect on the contrast of the words kasar and halus (rough and smooth) (Figure 9). The correct side of the spectrum rough-stift-soft-smooth was correctly assigned by 79 % of the respondents, which at least confirms the effect of the words in the environent on shape symbolism. What is more, English respondents who were allowed to change their decisions were 10 % better at assigning the meaning, which also supports the kiki-bouba effect. There is a significant above-random chance (+14 %) of a person who does not know a language to guess the meaning of the words in this language (sound symbolism). The hypothesis of the straight emotional effect does not apply (the pooh-pooh theory). Sound symbolism is distinct when distinguishing 2 opposites and the most distinct when we are allowed to see both of them at the same time. To the first point, when we compare results of this study to other studies on sound symbolism, we find that results of this study don’t significantly differ from previous studies. Indonesian, as an analytic and very open language has been shown to be a relatively rich source of sound symbolism before as well. The second point is based on the statistical discrepancy between the idea of emotional connection and the actual data from this study. Not many studies have been regarding this topic but data from this study do not show any patterns to discuss. The third point is a widely known fact mentioned in almost all studies about kiki-bouba effect. ⟵What is the potential of the intestinal microbiota as a target for treating obesity in comparison to current bariatric surgical procedures?